Where did Health-E Maximum Strength Vitamin E come from? Equine medical and surgical, is a company that emerged from a veterinary practice called Equine Medical and Surgical Associates in Pennsylvania. They have a full staff of veterinarians and have been around for 25 years. You can get all their products from their website but I like getting them off of Amazon.com just because I find it easier. The veterinary practice has a history of dealing with world class racehorses, showing hunter/jumper horses as well as pleasure horses, backyard ponies and even donkeys. So they basically have seen it all! And I like how accessible they are to the public. For example, you can call them directly if you have any further questions about the product at (610) 436-5174 or e-mail them at equinemedsurg@equinemedsurg.com. But most of all, I like how far they go in making sure their products are the best thing for your horse. Not only do they make sure, but they justify it by offering support and getting their products verified and certified by various external facilities. They offer support by stating that they will give free veterinary consultations to any horse owner that is using the product any time they need help with their horse. Dr. Frank Reilly, the senior vet on staff, will be just a phone call or e-mail away! Health-E Maximum Strength Vitamin E is also the only vitamin E supplement world-wide that has been certified and tested by Equi-Analytical Labs, Pennsylvania State Lab and Michigan State Lab. It got their approval rating because it’s low in sugar and carbs for IR/Cushings horses. Also there’s no lead, melamine, random drugs or pesticides that you can find in some other supplements. Finally it’s got the highest potency of vitamin E available in a supplement. You won’t believe it actually has a label! Besides being manufactured by actual veterinarians rather than just big companies that want to make money, this product actually has a label! If you read my other posts on equine supplements, you know that many similar supplements don’t include the labels prior to purchase or even at all. They don’t want to spend the time and money on patents and they’re worried that other companies will rip off their “top-secret” ingredients. Well that’s great except then horse owners like you have no idea what you’re actually giving to your horse. And as much as most likely it’s harmless it still just feels wrong to feed unknown stuff to your horse, right? Okay so you can see that there’s plenty of Vitamin E – you get 16,431 IU per oz of di-alpha Tocopherol Acetate. Furthermore, it includes all 8 forms of alpha tocopherol. If you’re not sure what this means, IU is just an international unit of measurement generally used for vitamins. Usually you’ll find that a recommended dose is anywhere between 600 and 10,000 depending on living conditions (related to the amount of grass intake), level of activity, age and specific health issues (with neurological issues requiring more). And alpha tocopherol are just presentations of vitamin E in different molecular variations. Different variations just means that the molecules have different orientations in space and each one interacts just a little differently with your horse’s body. Also, when you get a di- in front of the molecular forms, it just means that it’s synthetically formed. Finally alpha tocopherol acetate is actually considered the biologically active molecule. So to summarize, there’s a lot of very active vitamin E here. I know what you’re thinking – isn’t this too much? If the upper end of the recommended dose is 10,000, why would it be a good thing to feed my horse over 16,000. Well first thing’s first – your horse will not absorb all of the Vitamin E from a supplement the way they would from feeding naturally. A lot of the supplement will just pass through the system. Your horse’s body is actually very smart. Throughout digestion, it will tend to absorb what it needs, and the rest is just excreted – it ends up in the poop that you scoop up at the end of the day! 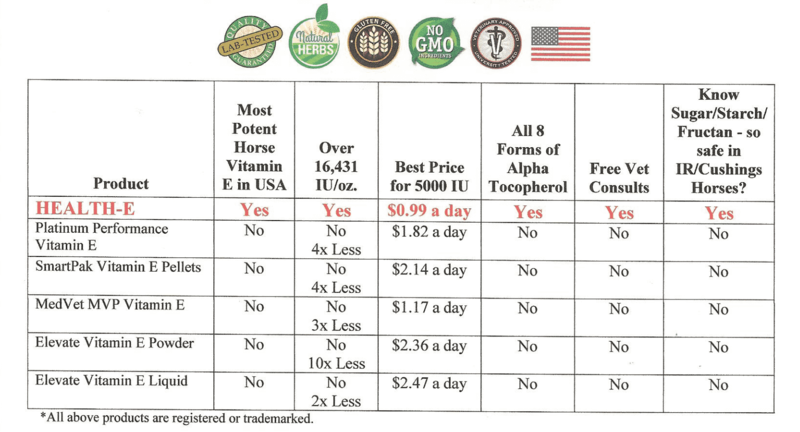 In addition to this, there is no science anywhere that shows too much vitamin E is in anyway toxic to your horse. The only thing is if your horse is already on blood thinners, then adding a very high dose of vitamin E could interfere with blood clotting. But if your horse isn’t on those, then you’ve got nothing to worry about. 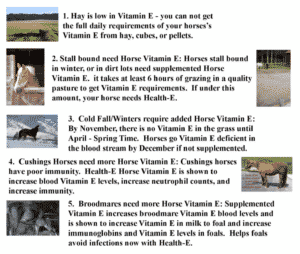 Vitamin E for horses – is it really all that important? Clearly, there’s plenty of hype about vitamin E and how it’s the “cure all” for all your horse’s problems. But is it really that important? And if so, why is it that important? Well first of all, your horse needs vitamin E every day. This is just a fact because your horse’s body uses it to perform a large variety of functions. These include muscle cell/tissue repair and regeneration, skin cell/tissue repair and regeneration, nutrient storage and use, proper immune function, proper toxic processing and liver function, eye function and other neurological functions. I know, right? It’s a lot of stuff! So if your horse is on a dirt pasture and isn’t getting nearly enough grass everyday, you know why his coat is looking a bit rough or he’s not jumping as well as he used to because his muscles are too sore. Also if your horse is extremely athletic such as a show hunter/jumper or a racehorse then he’ll need a lot of vitamin E. This is because during physical activity, your horse’s muscles are actually ripping. And then as the body heals and remodels them, that’s how your horse gets stronger. So he’s going to need a lot more than he could possibly eat in just one day of grazing even he’s out in the fields all day. I mean think about it – 1 full kg of grass is only 110 IUs. So to get even a conservative range of 2000-3000 IUs, your horse would have to eat like 20 kg of grass! Finally, if your horse has any type of neurological issues, that’s when it’s time to pack on the vitamin E like it’s your job. It plays a huge role in equestrian neurological function – and actually human neurological function as well! Severe vitamin E deficiencies can actually cause neurological issues in both species. #1 Rated – but what’s so much better about this product? Health-E Maximum Strength Vitamin E is the number 1 rated vitamin E product in the USA. So I wanted to do a little bit of digging and figure out why. One thing that I noticed was that there’s usually no expiry date or potency date on most vitamins but on this product, you get a potency date. Vitamin E can actually loose its potency over time so even from the pharmacy, if the product has been sitting too long there’s no way of knowing. And then we already know that it’s gone through a bunch of testing by various places for health and potency and that the vets will give you free consultations. And we also know that it’s definitely the most potent supplement up there since it’s over 16000 IUs and it contains all 8 versions of alpha tocopherol. So not only are they the most potent, but they’re the most potent by at lest twice as much. Furthermore, they’re beating their closest competitor on value by an entire 16%. That’s a big money difference when you’re thinking how long you might be using this product for. But how do you know that vitamin E is really for your horse? Will your horse really benefit? 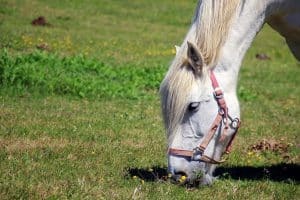 Not every horse will need these huge amounts of vitamin E. Some horses will do fine on a basic “multi-vitamin” type supplement during winter months. Some don’t need vitamin supplements at all because there’s no such thing as winter where you are and they can graze all year around. As I mentioned before, however, if your horse is an athlete, is getting a bit older or has symptoms of neurological dysfunction then it’s something that you might want to seriously consider. I mean with no toxic side effects, the only thing you’re risking is a little bit of money for the reward of a whole lot of health improvement for your horse. Oh wait! No I lied, you’re not even risking your money because if you don’t see the results you want in your first 2 month supply, then you can just get your money back. So really you’ve got nothing to loose. From show stars to oldies, a little vitamin E might just do the trick! We’ve established that Vitamin E is very important for your horse! 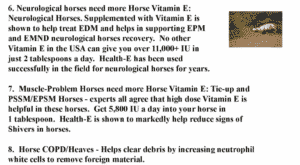 So if you think your horse isn’t getting enough or has a medical problem that might be treatable with extra, then it may very well save you a lot of problems to try out Health-E Maximum Strength Vitamin E.
If you try it and after 2 months, you don’t see any improvements that you expected then simply get your money back in full. Also if you have any concerns or questions at any point in time, you can always contact Dr. Reilly for free vet consults for your horse. Please shoot me comments and questions below! I’d love to answer them and to hear what you think about this product or vitamin E in general. ← How to Train a Horse to Load in a Trailer, Never say Neigh-ver! I’ve always wondered what went into keeping horses healthy, given their strenuous workouts, and grueling races. I really like watching the Triple Crown races on TV, and would really love to go see them in person some day. Do you ever attend the Triple Crown races? Does anyone you know own race horses? It’s too bad that you don’t own your own horse, but I’m glad you get to ride on occasion! Yes, there’s definitely work that needs to be in to keep very athletic horses healthy and injury free. Vitamin E is just one of the many things. There’s other supplements that horses can take as well – especially for preventing arthritis and joint degradation. Furthermore, the way that they’re trained plays a huge role. What an informative post! I honestly had not idea that vitamin E could be the secret to solving so many horse issues we face everyday. Makes me think also what the vitamins might be able to do for us, don’t you agree? Thank you so much for all the amazing info and I will make sure to look into into the supplement. Thanks so much for the positive feedback. And yep Vitamin E is definitely a trick used by plenty of horse owners, trainers and vets especially when dealing with older, sick or very athletic horses. Haha, yep! Vitamin E would probably do us wonders too although I’m not sure if it affects us in exactly the same way, I would have to look further into it. I hope that should you decide to try out the supplement that it’s helpful for you and your horse(s). Definitely let me know what you think when you have a chance! You can also buy Health-E at many local feed & farm supply stores, as well as at local tack & harness shops, nationwide. Thanks for your comment Dan. Yes, you’re right, Health-E is easily available at many stores nationwide.